A SUPER RAINBOW STRIPE COLORWAY!!!! 12 Different color stripes in a repeat! AND is avaialble with an option black or grey MINI SKEIN! Our dyed to order yarns ship in approx 10-14 days. Now that we offer 4 base yarns, we offer a 'Dyed to Order' system. 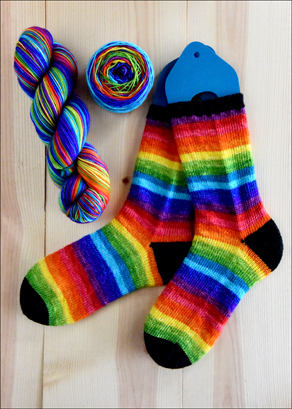 This colorway is "Absolute Rainbow" a Super Rainbow Colorway that we just cannot resist!! Red, Orangey-Magenta, Orange, Golden Orange, Yellow, Green-Chartreuse, Lime Green, Deep Teal, Gin Bottle Blue, Deep Blue, Violet and Orchid.